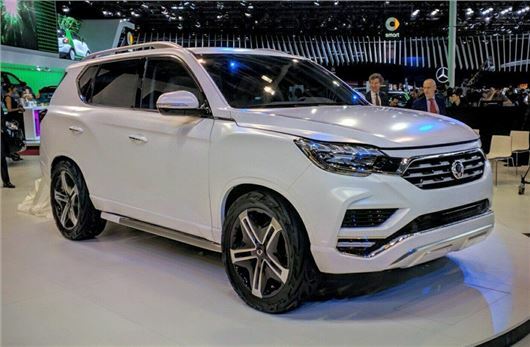 The new prototype of the new SsangYong Rexton has been unveiled at the Paris Motor Show 2016. The LIV-2 –which stands for Limitless Interface Vehicle – is expected to form the basis of the production version of the 2017 Rexton, which will go on sale in the spring. There are no details on pricing yet, but the new Rexton isn’t expected to venture too far from the current car’s £23,000 base price. As with all cars in the SsangYong range, it will be covered by a five year unlimited mileage warranty. The new SsangYong Rexton gets a fresh new look and is powered by SsangYong’s own 2.2-litre diesel engine, which should provide enough torque to match the outgoing model's 3.0 tonne towing capacity. A turbocharged 2.0-litre GDi petrol engine will also be available, although SsangYong hasn't released any details in regards to CO2 emissions or fuel economy. The interior features a significant step-up in quality, with more soft touch plastics and the option of leather seats, with massage functions. Smartphone connectivity is also improved, with mobile wi-fi, Apple CarPlay and Android Auto. Most of the in-car controls are operated via a large infotainment screen on the dashboard, although the steering wheel controls will operate all Bluetooth smartphone functions. SsangYong has pledged to improve safety across the board, with autonomous braking, blind spot detection and an intuitive a traffic alert system that will notify the driver of oncoming traffic when reversing out of a parking bay or driveway. I'm on my third ssangyoung,tivoli XLV Avery underrated car,and thinking to up grade to LIV next year but looking at the dash it's very bland ,compared to the tivoli. I no the trend is to cut down on things but this looks so old fashioned. Why don't the go for a full screen top to bottom ten inshes acros,and have all the tec on that,and have the plugins under that. Let's hope that keep the out side as it looks now. The one thing that is annoying with all new cars ,is doing away with CD, some off us oldes don't have I pads or downloads or understand it. We have loads of CDs but can't play them. Vic LONTON Witham Essex.